1. 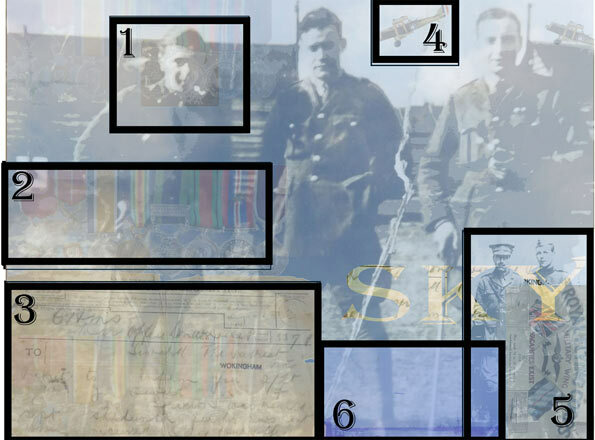 Walter John Seward from Gosport was a reconnaissance pilot with the Royal Flying Corps (RFC). He flew over Passchendaele with a heavy camera and took photographs, which aided strategy of future battles. Due to bad weather during a mission, he crashed his plane yet survived and went on to fight in both world wars. Throughout his career he worked his way up from the bottom of the RFC to almost the top of the RAF when he retired as an Air Vice Marshall. We constructed a model of the type of planes used in the War with a community group- Give, Gain & Grow. They appreciated that our construction methods of a thin frame coated with material was not much more elaborate than the designs of the real thing! 2. The medals shown have all been awarded to Walter John Seward. These include the WW1 Campaign medals – The 1914 Star or 1914-15 Star, British War Medal and Victory Medal. These medals are affectionately called Pip, Squeak and Wilfred. When the WW1 medals were issued in the 1920’s it coincided with a popular comic strip written by Bertram J. Lamb and drawn by the cartoonist A.B. Payne. Pip was the dog, Squeak the penguin and Wilfred the young rabbit. For some reason the three names of the characters became associated with the three campaign medals being issued at that time to many thousands of returning servicemen. 3. 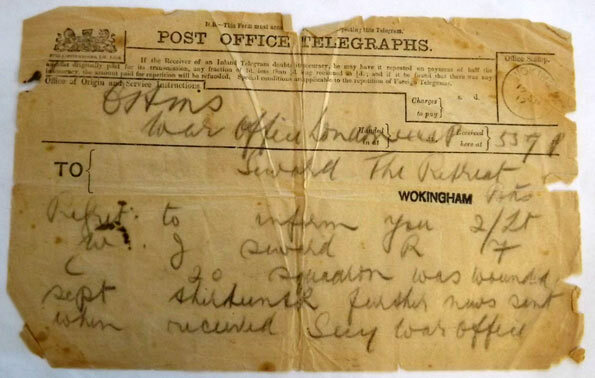 A telegram sent to the mother of Walter John Seward, with respect his temporary disappearance. Reads as follows: 17th September 1917 Regret to inform you Second Lieutenant W J Seward Royal Flying Corps 20 Squadron was wounded September. Further news sent when received. Secretary War Office. 4. 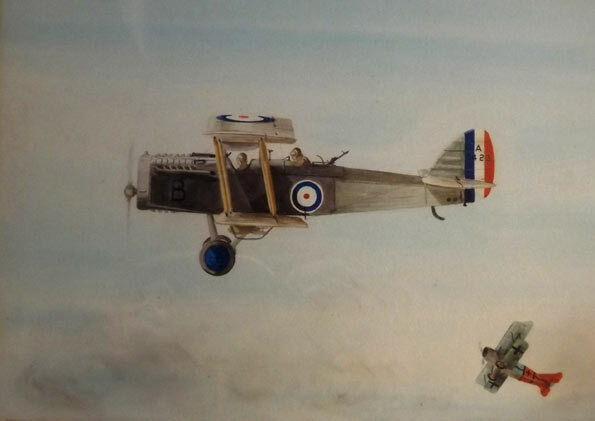 The plane portrayed was taken from print that was hung in the Officers Mess, Alverbank, Stokes Bay. It represents a typical World War One plane. People of Gosport witnessed planes training in the air and practicing their dog fights. Grange airfield was instrumental to flight development and training for the war effort. The site has evolved over the years under various names including- RNAS Gosport, RAF Gosport, HMS Siskin and HMS Sultan. The group Loud and Proud helped us create a number of models representing tanks, planes and boats of the era. 5. 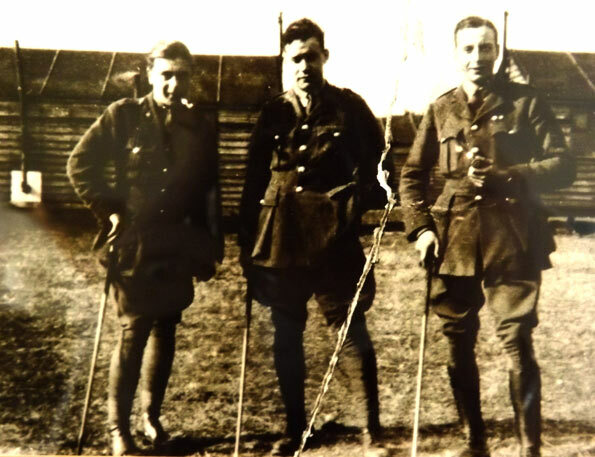 “Ferdie” Waldon (Left) was the Commanding Officer (CO) of 60 Squadron. Unfortunately he was killed during the Somme offensive. 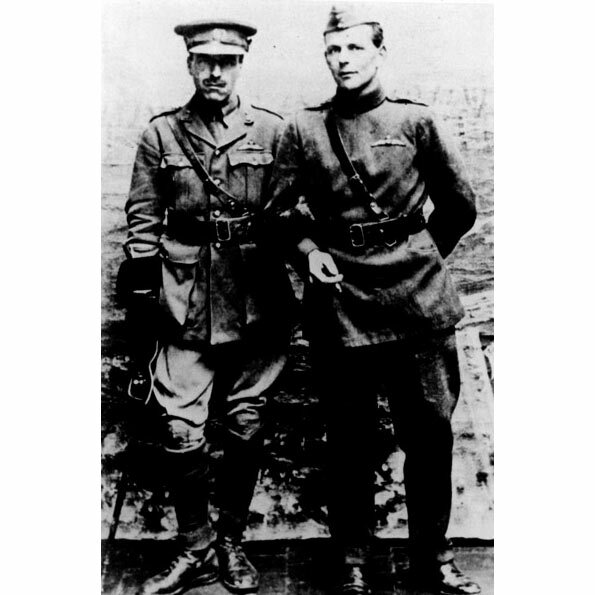 He was succeeded by Major Robert Smith Barry (Right). The new CO revolutionised flight training in Gosport. He emphasised the importance of teaching instructors and trained them to teach pupils how to get out of flight difficulties as opposed to avoiding them. He encouraged the use of dual control planes in which the instructor and student could communicate by means of a rubber tube headset system known as the Gosport Tube. Todays’ wireless version is still referred to as the Gosport Tube. The principles of “The Gosport System” of flight training are still the basis of training throughout the world today. 6. 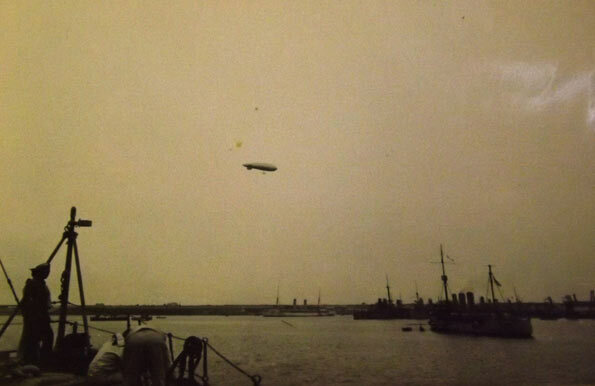 Airships Gamma and Beta, similar to the German Zeppelins were so visible that they could be viewed from wherever you were in Gosport. This image shows one over the Harbour.